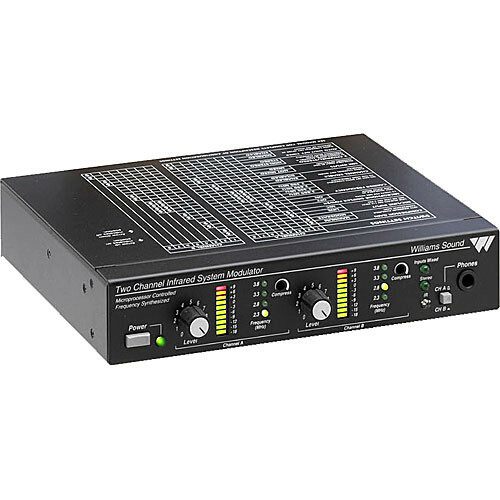 The Williams Sound MOD 232 Infrared Modulator is simply the audio front-end that connects any PA system with the WIR TX9 Emitter, for transmitting wireless audio signal to compatible receivers via infrared. The MOD 232 is capable accepting two audio channels and features two 1/4" phone & XLR combi-connectors. Two Baseband output connectors are used to connect two WIR TX9 Emitters and a Baseband input is featured for daisy-chaining a second MOD 232 Modulator. Discrete RCA phono audio line outputs are provided for each input channel and may be used for sending input signal to recorders, amplifiers, etc. The MOD 232 features frequencies that are user switchable between 2.3, 2.8, 3.3 and 3.8 MHz. Each input channel features a level control dial and comprehensive metering. Note: For use with the Williams Sound WIR TX9 infrared emitter. The MOD 232 is capable accepting two audio channels and features two 1/4" phone & XLR combi-connectors. A Baseband input is featured for daisy-chaining a second MOD 232 Modulator. Each input channel features a level control dial and comprehensive metering. Box Dimensions (LxWxH) 11.6 x 9.4 x 6.0"